We forced ourselves to sit through Grudge Match, despite our desire to shut it off at various points. Two highly professional actors seem hellbent on turning the clock back. Robert DeNiro and Sylvester Stallone were the epitome of boxers in their prime. 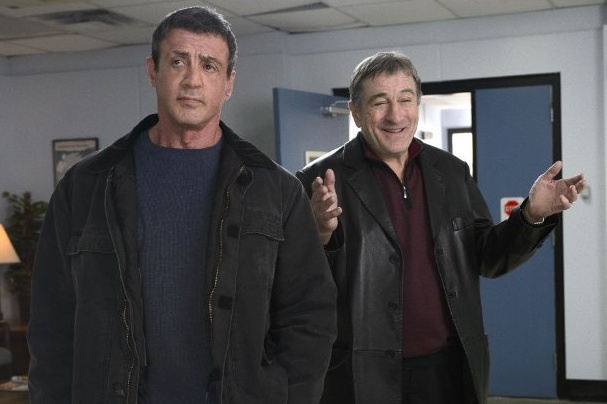 Greed forces them with the assistance of Kevin Hart and Alan Arkin to do a geriatric version of Rocky Vs. Raging Bull. Here they are shadow boxers named Razor and Kid. The cutesy stuff starts early—with both men sharing an interest in Kim Basinger, their old flame. The film is at its best when it is parody, and at its worst when it takes itself to ridiculous ends. We did like the montage of LaMotta and Balboa in their boxing glory films, and we found the photo-shopping of them fighting each other in youth to be a good place to stop the movie. Alas, it goes on to the requisite major bout where two aging actors box for nine rounds to a sold out crowd, and with points to be made on all sides of the script. We almost guess that each star has exactly the same amount of screen time, down to the nanosecond. If the film had stayed the course as a light satire of their early film images, we’d probably have enjoyed it much more. Training time is a take-off on the earlier bits by Rocky in every one of his movies. Yet, Stallone already did this in Rocky Balboa (VI). We were reminded of aging Brando playing a godfather in a weak comedy toward the end of his career and life. These may not be the lasting images we want of Stallone or DeNiro. Worse yet, they seem to take their images all too seriously at the climax. We stayed the course till the bitter end, and are much sorrier for the experience.